Manufactured from EPDM rubber. Low Temperature Pipe Boots are compounded for maximum resistance to ozone, UV light and extreme temperatures. 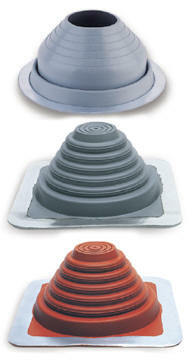 Flexible aluminum base will allow the flashing to conform to any metal roof configuration. Pipe location can be centered in the flat of the panel or rib. Urethane sealant and self drilling complete the installation. Roof Jacks are well marked, so they can easily be cut with shears to fit the exact pipe size used. #2 1 1/4" - 3"